Holly is an amazing jewelry artist who sells her unique and diverse jewelry through her Etsy shop, Tuscan Road Designs: http://www.etsy.com/shop/tuscanroad Whether it is a necklace, bracelet or pair of earrings, her eye for the beautiful is exemplified in every piece. She refers to her beautiful work as "an eclectic mix of mod and vintage," utilizing components such as semi precious gemstones, crystals and beautiful Lampwork beads made by herself and her son. 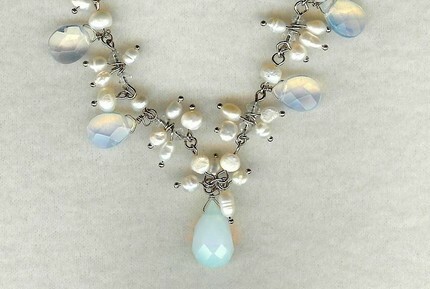 She doesn't follow trends; she wants to set them by being consistently inspired, always keeping her eyes open for "that unique and beautiful bead or idea to incorporate into my designs." Holly is inspired by nature, Old World icons, the world around her, nature, and architecture. 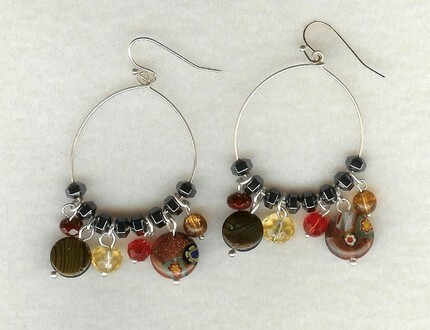 Her incredible work began with a trip to Tuscany, Italy, where she visited the glass and bead factories on the island. And she was hooked. Returning home, she promptly took a class in making Lampwork beads, which she incorporates into her lovely jewelry pieces. Beautiful pieces and nice post! It always so fun to read the posts. Thank you for your kind words! Interesting post! I love the pieces you chose to showcase too, especially the earrings! Nice post I love her work! I think it's so cool that she makes her own lampwork beads. Love that! Great post, love her jewelry! Beautiful jewelry designs. Very nice post! Great post, I love that necklace!